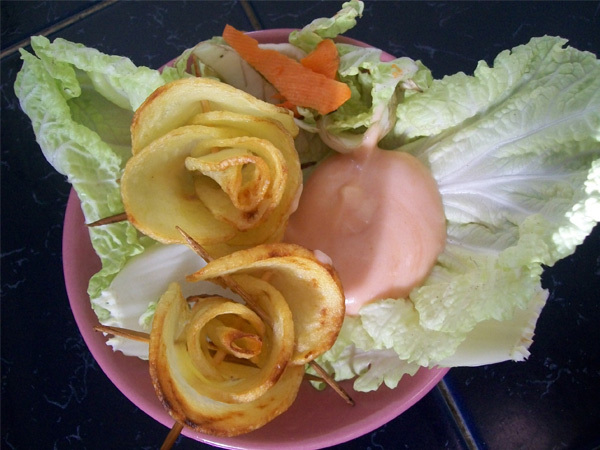 I have seen a rose potato in the web. It shows exactly what you need to do to make it. I had been planning to make one. Today, I decided to do it. This is a healthy snack for Bella. She actually liked it. She said "bite flowers" and she was even looking for "trees" lol. Maybe next time, she can eat a tree made from other stuffs. 1. Peel the potato. Although, some would prefer not to peel it. In my case, I peeled it since Bella will be eating it. 2. Cut it thinly. You can cut it crosswise or it whatever way you want as long as you will get a thin slice just enough to be rolled to form the flower. 3. Get one thin slice and roll it. This will serve as the center of the flower. 4. Get another piece and lay it outside the rolled one. Then place another on the other side. Hold it in place with a toothpick. 5. Repeat the process until you get a rose-like look. Just place a toothpick whenever you feel that the potato needs to be held on place. 6. Deep fry it. Or take a picture of it first if you want to.lol. 7. Place it on top of a kitchen tissue paper so that the oil will be absorbed. 8. This one is optional. I mixed sandwich spread and ketchup so Bella can dip the potatoes into it. They taste good together. Here is the picture I saw that would teach you how to make it. This is actually clearer than my instructions haha. Check it out. You can make lots of roses. It doesn't only look beautiful but it tastes yummy. Look at how it was presented in number 9. 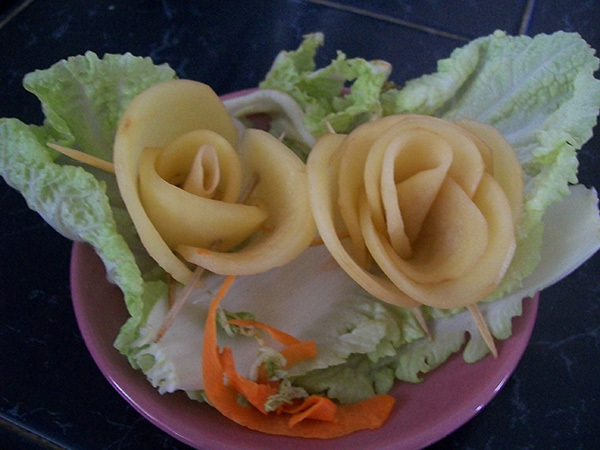 The thinner your slices are, the prettier roses you will make and the crunchier they will be. This is how the potatoes looked before it was fried. You can notice that it looks different from the ones above because I wasn't able to cut them really thin. 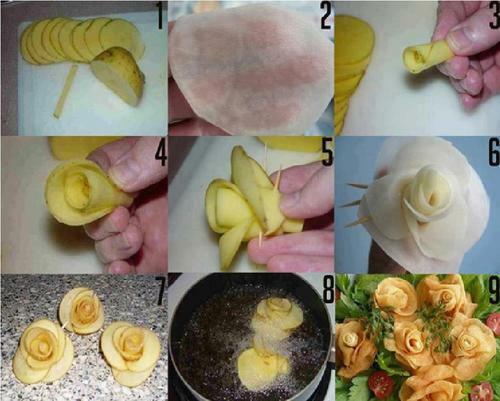 I'll try to figure out how to do it so I can achieve a prettier rose next time. Well, at least Bella had a healthy and yummy snack today! So this is the first entry for our DIY Foodie :) Look forward for more! I already have something in mind for the next post. Nice one! :) Will try this too! That is the coolest thing! This would make such a cool presentation on your table. Thank you for sharing it on our Four Seasons Blog Hop. Pinning now and going to pass it on . In fact, we like it so much that it is being featured on this week's Four seasons Blog Hop (starts this Wednesday night)!